The chaste tree is in full bloom during the months of July and August. I focus on water-efficiency in my landscape choices. One of my favorite summer-blooming small trees is chaste tree (Vitex agnus-castus), native to the Mediterranean region into central Asia. If you are in the Cedar Ridge area, stop by the post office soon, where a specimen of this summer bloomer is now covered with large clusters of blue-violet flowers. This particular tree began its life with a history of winter damage. Since the day of dedication of the new post office (the fourth) was in November 1989, my guess is that a young Vitex was pushed over by the heavy snows in February 1990. No one thought to straighten it in its youth, so it grew leaning over, prostrate. While I observe many plants, young and old, when I am out and about in the community, I did not notice this wonderful tree lying on the ground in its youth. After a few years the Cedar Ridge chaste tree starting blooming more abundantly, and then it could not be ignored. The color and abundance of the flowers is striking. After many years in the post office landscape, someone took an interest and pruned it heavily. By then it had spent many seasons maturing, and the trunk was so strong, the Vitex could be pruned only as an ornamental shrub, multi-stemmed and close to the ground. Pruned as a small tree in my own garden, in winter I trained the young tree to be multi-stemmed, with the foliage development above the gray trunks. Because it is growing on level ground, I can see through the trunks to the landscape beyond. This summer I’ve enjoyed the bright gold of Rudbeckia “Prairie Sun” (gloriosa daisy) near the Vitex. Very attractive clusters of flowers open in early July and continue into August. Two white-flowering cultivars of Vitex include “Alba” and “Silver Spire.” “Rosea” is a pink cultivar. There are several variations of the blue-violet Vitex on the market. 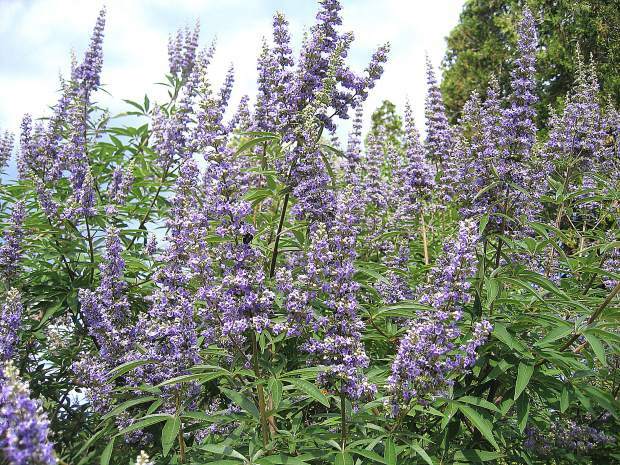 Select a plant already in bloom, or order Vitex agnus-castus “Latifolia” from Forestfarm Nursery in Oregon. This cultivar has larger flower clusters than the species and will grow quickly from a young start. Even as blooms fade, the aromatic gray-green leaves hold their beauty through summer heat. Flowers transition to a seed stage, a fall focal point. Leaves change to a golden green before drifting to the soil. In winter the gray bark and seed heads add a seasonal dimension in my garden. So attractive is the Vitex in winter that I postpone pruning until buds begin to show for spring. A deer-resistant tree (sometimes grown as a shrub) for full sun and small spaces, the chaste tree needs very little summer irrigation, although it will tolerate water once a week if the drainage is good. Winter drainage is just as important, which makes this a good choice for sunny slopes. In foothill areas, with our cold winters, Vitex grows to about 15 feet in height and spread. In warmer climates of California, the mature height and spread is greater, to 25 feet. However, it is possible with winter pruning to maintain a lower and denser canopy. Vitex could even be pruned to one to two feet in winter for three to four-foot upright growth with the same summer bloom. Soil preparation at planting time should include adding some compost and natural phosphorus (colloidal or raw rock phosphate) to our native clay soil. A few years ago my son Sean, who lives in Carmichael, was asking about small trees for a very sunny area of his entry landscape. I suggested Vitex. Three years later it is the talk of his neighborhood. People out walking stop to ask its identity. Although the Sacramento area is well known for its trees, I have never seen another chaste tree in the area. This is an excellent water-efficient insectary plant. As I watched the honeybees and native bees forage in the Vitex blooms in Cedar Ridge last week, my attention was captivated once again. I appreciate that this wonderful local plant has been given some loving attention.